Wreaths | Our Farm by Earth Flora Inc. I truly sense people are going back to the old. Christmas wreaths have always been a tradition, with evergreens handpicked and carefully arranged in a crown. The past years however have substituted the fragrant wreaths with circular arrangements of plastic leaves, silver bells and golden balls. This year however, I noticed a surge in people buying our Advent wreaths, or better yet, buying pine leaves and cypress, berries, pine cones and tiny limoniums from our farm and shop. If you want a little history, wreaths are associated with Apollo, the Greek god of life and health. That is why Greeks use the wreath as a crown for the Olympic games. 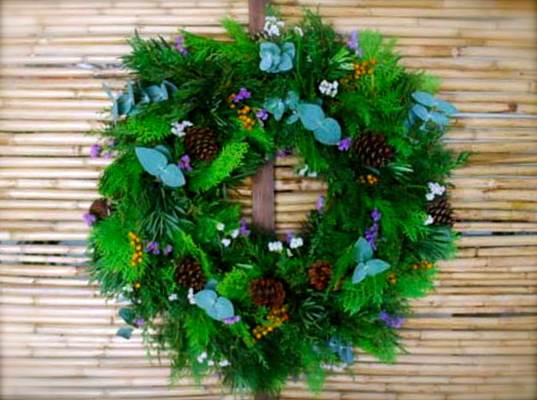 Traditional wreaths have always used evergreens as a symbol for strength of life. These leaves are able to stay alive even in the harshest of winters. Do you know that you can also use laurel leaves for your wreaths? These have a nice scent and the smokey green color does wonders for your halo of leaves. I made an Advent wreath for our home and the kids have a wonderful time smelling pine and rosemary, picking on berries and lighting candles. It is quite easy to make. Here in the Philippines, you can use leaves such as pine and cypress. You can add some rosemary and eucalyptus leaves too. Branches, twigs, every little natural thing you find in your garden or yard can provide a nice touch for your wreath. I use pine cones, some red berries, and add little sprigs of limoniums which are purple and pink. 1. Gather or buy an armful of leaves. You can find pine and cypress leaves at flower shops or markets. 2. Cut them into 6 inch sizes. 4. I use a 12 inch Oasis floral foam that is already circular. You can buy floral foam from the flower market or flower shops. Dip the base in water until the foam is damp but not fully saturated. 5. Insert your foliage or leaves first and start placing them around the frame. Keep the stems short and fill the entire wreath. I usually start with cypress leaves as a base and then alternate these with pine leaves. You will have a nice fun time putting leaves around the frame. Make sure that the stems face the same direction. 6. Add pinecones by twisting wire around the base of the cone and then tying the cone’s tail to the wreath. 7. You can also add red berries and limonium flowers for final touches. 8. If you are using the wreath for Advent, simply insert 4 candles into the foam or wire wreath. The wreaths stay fresh for four weeks. Just spray it with water and sprinkle some water on the base. Everyone should make a wreath because nothing compares to scents of fragrant pine or herbs wafting through the house, especia. Christmas is in the air.